we've two maps tuned on a dyno. One is mine for the 140 HP engine (EbisUltimativeRace.., it took about 50 dyno runs) und the other is Quattros for the 120 HP engine (QuattrosUltimative..., data logging during real driving and dyno runs). Based on these two maps, some derivates were generated having some finetuning. But of course, these dyno maps don't take 10L, they are in the range between 6 to 7.5 L and they might be still a little bit rich. 6-7.5L do sound correct. Higher consumption, when running on light gas, is simply indication of wrong mapping, if we are talking about 9.5 and i guess it is not much different with Corsaro? Thats a lot dyno runs! It would be very interesting to hear your complete story and how you have done it, as mine was only 7 runs or actually each run includes 10 separate runs with different throttle opening. Anyway my point is this: turbo engines are very simple to tune by changing chips or maps. 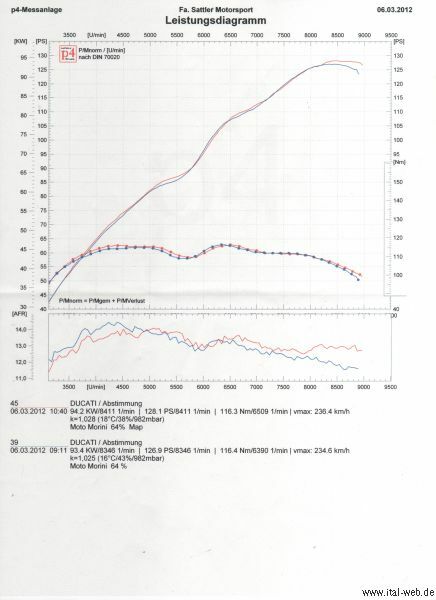 Naturally aspirated are much more delicate and best result can only be achieved by private dyno-runs. Even different or clogged air filter can alter results greatly. Cause of this and some other thing, i need to do a new dyno run next spring. Still i like to see how AFR looks like in different situations. And only way is a AFR meter while riding. And yes, a bit rich is better than lean. At least for exhaust valves, although i hope to run more lean on light gas to find best AFR for mileage there. And actually your ideology with mappin looks very similar to mine http://www.ital-web.de/forum/viewtopic.php?p=47446#47446 (grey line) with more stoichiometric mixture below 4000 or was that only concidence and cause of different engine setup? there was a little misunderstanding. The 50 runs took place at one day with different throttle positions and fuel map values. Blue line is the prerun, then I adjusted the fuel map and red line is after adjustment. We did this at the front cylinder and afterwards at the rear one for many TPS values. The displayed values are valid for TPS 64 degree at the crankshaft, not at the rear wheel. At full throttle we reached 141 HP and 127 Nm. The point was, that my bike ran perfect with an acceptable consumption of app. 7L, so there was no need to invest extra time and money. You do not need SCANM5X either. You get same information and more with Ducatidiag and Guzzidiag. You only need choose proper parameters and turn logging on. Only problem is the values Lambda is giving out, as they are in millivolts, i recall. This log you can put in Excel and manipulate lambda values, as needed.